This image was inspired by bears and their cute characteristics. I love bears and since my husband is a wildlife photographer, I get to go on many outings with him. On these excursions we have seen many bears and some are so adorable it’s hard to imagine how fierce they can be if threatened. 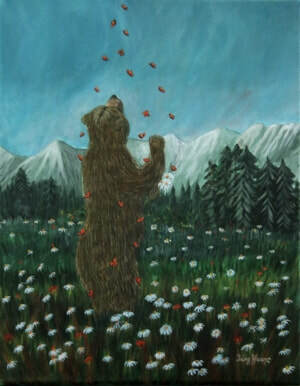 In this image, I painted the majestic mountains of Kicking Horse country where a cinnamon bear was collecting daisies to feast on; Distracted by a swarm of butterflies surrounding her, she stood up and mused over them, allowing herself a little break to take in the beauty of these lovely creatures.